R4 Post-Match: Leon Cameron GIANTS coach Leon Cameron speaks to the media after a hard-fought four point win over Geelong in round 4. 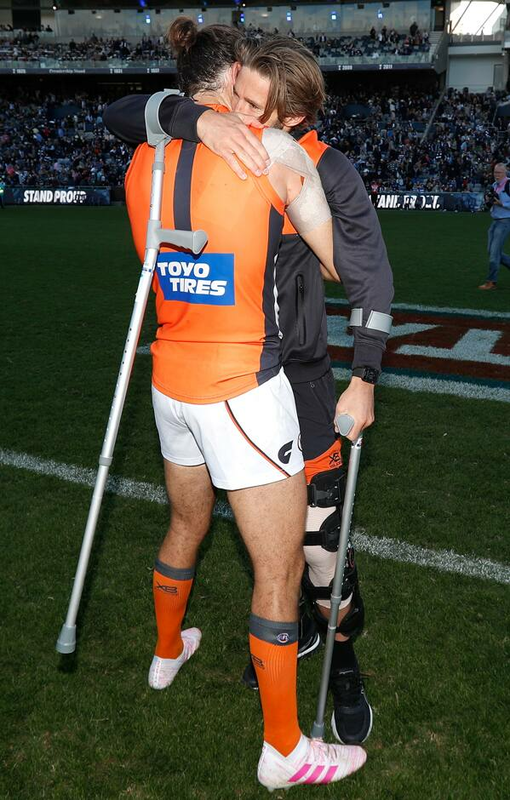 Co-captains Phil Davis and Callan Ward embrace following the GIANTS' win over Geelong. In parts it's a bittersweet win because of the Ward stuff but I'm really proud the guys galvanised together. Leon Cameron has described the GIANTS brave four-point win over Geelong at GMHBA Stadium as "bittersweet" as the GIANTS face the prospect of losing co-captain Callan Ward for the rest of the season. Ward went down with a suspected anterior cruciate ligament tear to his left knee five minutes into the game, and is likely to not play again in 2019. The skipper was seen in tears on the interchange bench shortly after the incident, but at three-quarter time of the close contest addressed his charges before they overcame the Cats. Cameron said the club is expecting scans to confirm the worst. "That's what we're probably thinking. Until it's confirmed by scans in the next couple of days, I've got my fingers crossed," Cameron said post-game. "It was one of those awkward things. He was in an awkward spot when he got tackled and that's footy. Cal will be the first one to say that's life. He gets on with things and why we love him so much, and why he's been our co-captain for so long. "In parts it's a bittersweet win because of the Ward stuff but I'm really proud the guys galvanised together." Ward also spoke post-game, saying he immediately knew he was in trouble. "I think it looks like an ACL," he told Fox Footy. "It's still hard to tell at the moment, but it didn't feel good when I went down with it, so we'll see how the scans go tomorrow." The GIANT said he was overwhelmed once he realised the potential seriousness of the injury. "I think I was in a bit of shock to be honest. I've never hurt my knee like that before and I think I realised I was out for the year, really," he said. The 29-year-old, who was playing his first game of the season after an injury to his right knee in the JLT Community Series, dragged the GIANTS together at their final huddle. "The moment was there and 'Wardy' took the opportunity and addressed the boys. With his standing in and amongst our footy club and the AFL competition, I think everyone knows he's one of the toughest players going around. He delivered a 30-second speech so we can thank him for getting our boys up," Cameron said. The win leaves the GIANTS placed nicely at 3-1, with their only loss coming against reigning premiers West Coast at Optus Stadium. Cameron listed youngsters Aiden Bonar, Jackson Hately, Nick Shipley and Xavier O'Halloran as players who could come in for Ward, while matchwinner Toby Greene is expected to return next week against Fremantle. Greene has not played since round one as he deals with a calf injury. "He's running really well. I've just got to be mindful it's a really long season. If it's not next week [that he's back] it'll be the week after," Cameron said. "If it gets to Wednesday [and] he's going well, he'll put his hand up and want to play. I've found that this year, though, by holding (Josh) Kelly back, and we gave 'Wardy' an extra week, we've got to continue to look at that. "If we don't think he's 100 per cent we won't pick him, but he's probably 99 per cent [likely] to put his hand up."